This entry was posted in Racing on February 14, 2011 by Steve Tilford. Okay, most of you guys aren’t that interested, but tonight is a big game of college basketball in Kansas. Instate rivalry of KU vs. Kansas State. At 8pm CST. 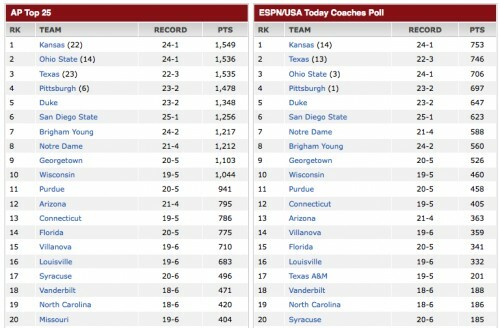 Kansas is ranked #1 in the country as of this afternoon. KSU lost on Saturday in Colorado. Should be a pretty good game. I’m for KU. The coaches-in-little-boxes thing is NOT a good idea. I guarantee ESPN will never do this again. But you can’t argue with trying it once (kind of like the NFL game that was broadcast once with no announcers). I think it went just fine!